Competition at the GHSA State Track Meets begin on Thursday at three sites with 90 DCSD student athletes competing for individual and team state titles. DeKalb has 16 of its 19 schools with track programs represented by at least one athlete including 47 girls and 43 boys along with 16 girls’ relay teams and 13 boy’s relay teams as the state track meets finish with the track finals on Saturday. Three-time defending champions Cedar Grove Saints lead the way as they send nine individuals and three relay teams to the Class 3A Boys’ State Meet at Hugh Mills Stadium in Albany. Coach Jimmy Smith’s squad is going for its fourth consecutive Class 3A boys’ title led by sprinters Israel Spivey and Kortney Cox as both qualified in the 100 and 200-meter dashes and Cox also in the triple jump. Defending Class 3A 110-meter high hurdles champ Jadon Haselwood returns to defend his title and also compete in the 300 hurdles along with teammate Dimitri Cooper. Keshun Byrd is set to compete in the high jump, long jump and triple jump. 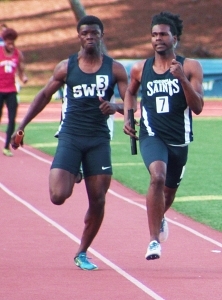 The Saints also have one 4x100m relay team and two 4x400m relay teams qualified to compete. Redan has two individuals and two relay teams competing while McNair and Towers qualified a pair of individuals and Stone Mountain one. Cedar Grove also leads the way in the girls’ Class 3A qualifying for DCSD with eight individuals and three relay teams headed to the competition. 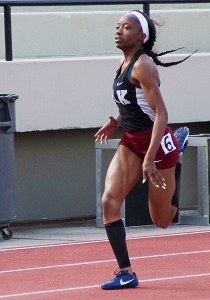 Roben Heard (100M, 200M), Jada Hall (100M, 200M), Hadiya Barnwell (400m, triple jump) Chanlor McGhee (100m hurdles, 300m hurdles) and Antania Swain (shot put, discus) have all qualified in two events at state. The girls have one 4x100m relay team and two 4x400m relay teams set to run. Redan has a pair of qualifiers led by Samira Allen (100m hurdles, 300m hurdles) and a relay entry in both the 4x100m and 4x400m relays. Stone Mountain is sending Toni Pellington to compete in the high jump and long jump field events. Five DeKalb schools are set to send participants to the Class 5A State Meet at Grisham Stadium in Carrollton in the three-day event starting on Thursday. Coach Eric Keddo’s Miller Grove girls’ team leads the way as nine individuals are qualified along with three relay teams as they try to break a three-year state title drought by DeKalb at the girls’ state meet. Keddo’s team was the last to win back in 2014. Defending 800m run state champ Emoni Coleman returns to defend her title as well as going for the gold in the 1600m run and Kayla Williams is ready to perform in the high jump and triple jump. The Lady Wolverines have one entry in the 4x100m relay and two in the 4x400m relay. Arabia Mountain is sending a strong contingent to Carrollton as well with six individuals and two relay teams. 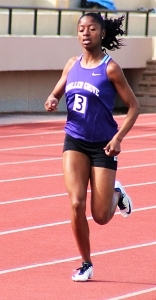 The individual entries are led by Samaria Allen who is set to compete in the 300m hurdles, long jump and triple jump. Destiny Walker hit the track in the 100m and 200m dashes for the Lady Rams which has one entry in both the 4x100m and 4x400m relays. Southwest DeKalb has two individuals and a 4x100m relay team competing while Chamblee has two individuals led by distance runner Beining Xiao in the 1600m and 3200m runs. The Wolverines lead the boys’ contingent with four individuals and three relay teams set to compete. Walik Robinson is set for both the 110m hurdles and 300m hurdles. Miller Grove has one entry in the 4x100m relay and two in the 4x400m relay. Arabia Mountain’s Jordan Barrow leads four competitors and the 4x100m relay team into competition for the Rams. Barrow is set for three invents including the 100m and 200m dashes and the long jump. Nicholas Edwards leads three Southwest DeKalb Panthers as the Region and Sectional top performer in the shot put and discus looks for gold. Chamblee’s Charles Holt (3200m run) and Clarkston’s Ngabo Daniel (1600m run) are also headed to Carrollton. Stephenson leads four DCSD schools into the Class 6A state championship at Grisham Stadium in Carrollton this weekend with five individual and two relay teams in both the girls’ and boys’ meet. Simone Harper leads the Lady Jaguars group as she is set for both the 100m hurdles and long jump competitions. Stephenson has an entry in both the 4x100m relay and 4x400m relay. Martin Luther King Jr. is just behind with four girls’ individuals led by Sectional 100m and 200m dash champ Kayla Hunt. The Lady Lions also have entries in the 4x100m and 4x400m relays. Dunwoody has three girls’ headed to Carrollton led by Ariel Lawrence in the long jump and triple jump. The Jaguars individual competitors are led by up and coming freshman Bradley Favors who is headed to compete in the 200m and 400m dashes. Stephenson has an entry in both the 4x100m relay and 4x400m relay. Jhivon Wilson leads a trio of Martin Luther King Jr. Lions into the state meet as he qualified in both the 100m and 200m dashes. The Lions are set to compete in the 4x100m relay as well. Tucker has a pair of individuals in DeKairi Brown (high jump) and Justin Mitchell (triple jump) going to Carrollton. DeKalb has a small contingent headed to Berry College in Rome this weekend with six individuals and two relays readying for the Class 4A and Class 7A state meets. Druid Hills has Genevieve Ferrara (800m run) and Amber Austin (300m hurdles) and a 4x400m relay set in the Class 4A girls’ meet. The Red Devils entries include Clark Shepherd (long jump) and the boys’ 4x400m relay squad. Lakeside is sending three girls to run in the Class 7A meet including Chanel Bishop (200m dash), Emma Hanson (3200m run) and Nyla Fuqua (300m hurdles).